Global Village manager Clarissa Swain shows some merchandise made in India made from automobile inner tubes. Global Village Gifts, found at 69 E. 100 N. in Logan, boasts they are the only fair trade store in the United States. Their merchandise comes from 48 different countries on several different continents. Fair Trade is the alternative approach to international trade. 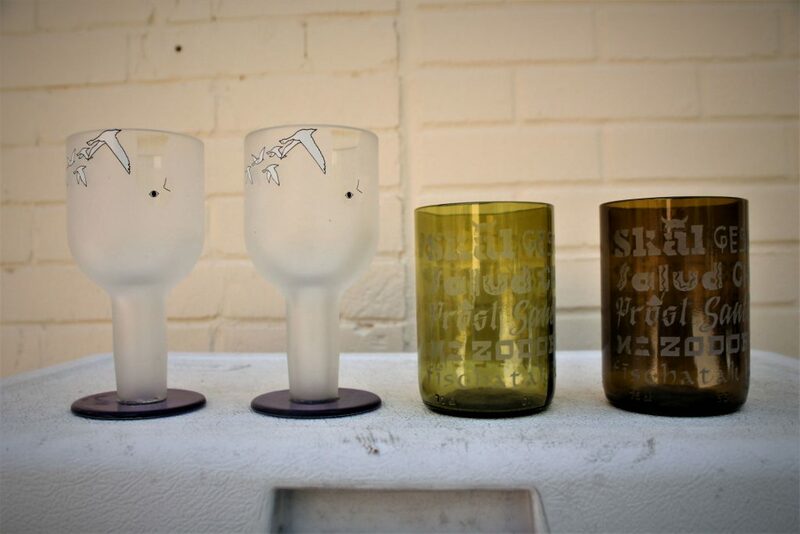 There are journals made out of elephant dung, purses made from automobile inner tubes and drinking glasses made from wine bottles, to name only a few items that can be found at the nonprofit Global Village Gifts. 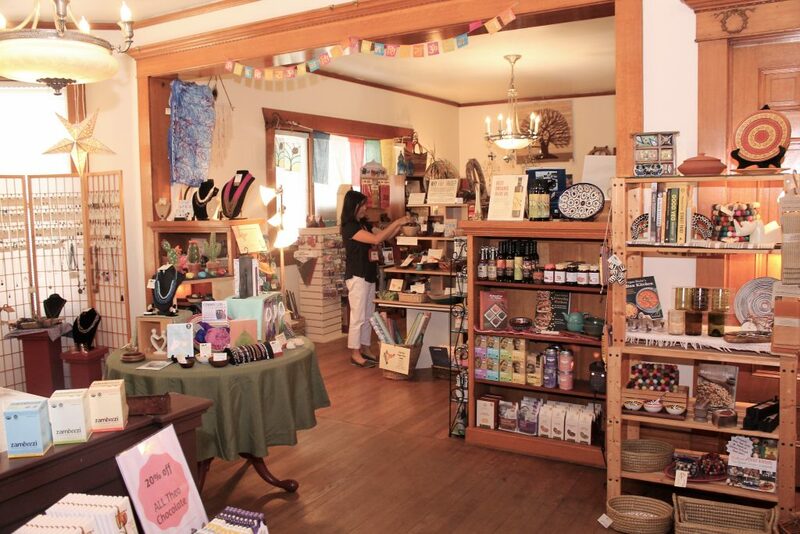 Crafted jewelry, sculptures, nick-knacks and crafty recycled metal can be found on the shelves of the store. Hearts carved from soapstone are some of the merchandise found in the Global Village Gifts. Swain, a Utah State University Family and Consumer Science graduate, loves where she works. Swain said, for instance, elephants and farmers don’t get along very well in some countries. The Utah Valley native recently spent three weeks in Uganda. She was able to watch some of the artisans at closer view and witness how some of the products in their inventory were produced. 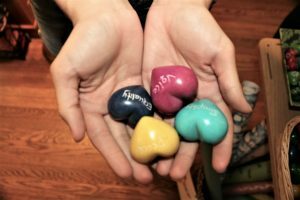 Hailey Elliott, who hails from Alabama and coordinates almost 30 volunteers, held some hearts carved from soapstone as some of her favorite merchandise. And then there are they seismic critters made in Mexico that are set on a table or shelf and can warn people when an earthquake is coming by how they move. Swain said the building they are in is owned by St. John’s Episcopal Church next door. 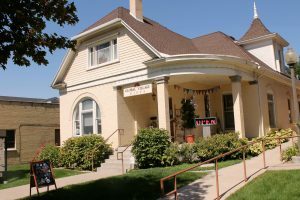 And because they are a nonprofit, the church works with the store on their rent. The store has only two paid positions at the store, Swain and Elliot. The store associates including the board of directors are all volunteers. Global Village Gifts has on hand wine bottles turned into beverage classes. 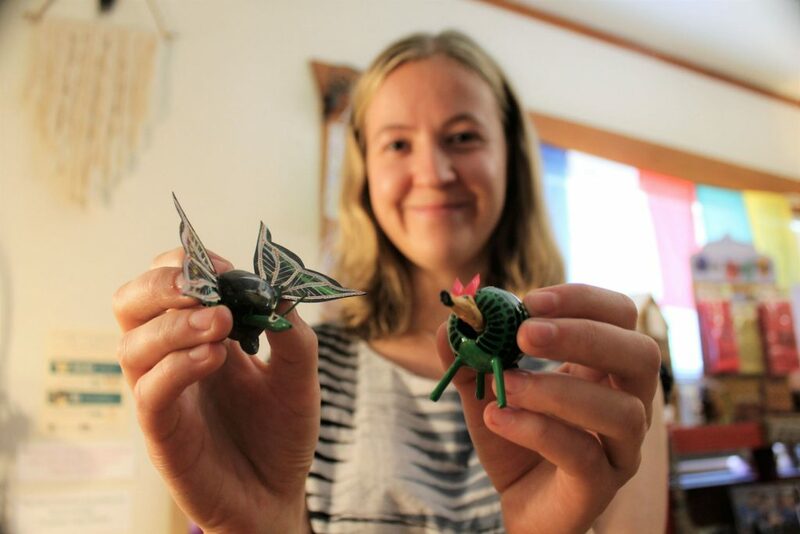 Global Village Gifts manager Clarissa Swain holds up Seismic Critters used and sold in Mexico. The little toys also can warn people of seismic activity like earthquakes. Karen Ensign a volunteer from Providence rearranges merchandise in global Gifts. 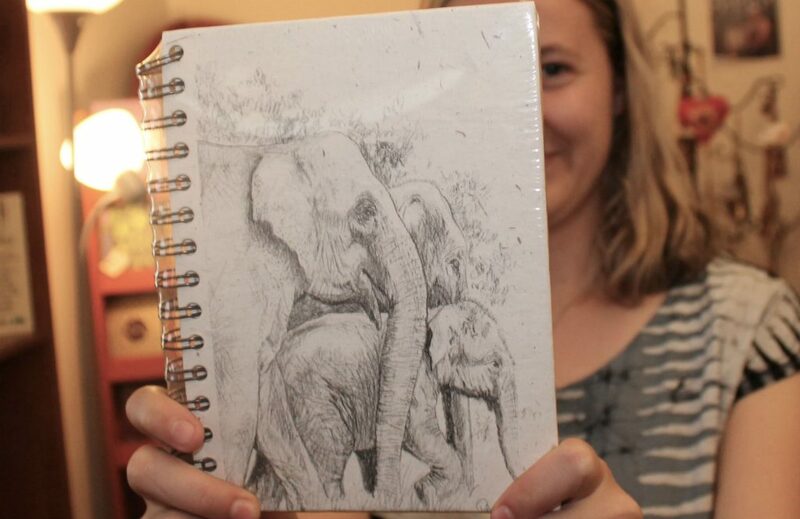 Global Village Gifts store manager Clarissa Swain holds up a journal made of elephant dung.